The computer screen appears brighter in darker environments, for instance when you are working on your computer late at night or in a darkened room. Website with lots of white space or other bright colors are often hard to look at during that time, or at least uncomfortable first until you get used to the glaring light. Programs like F.Lux have been designed to reduce that effect during the evening and night period, and while they work very well, you may prefer a different solution instead. Maybe you are working on a company PC and cannot really install desktop software on it, or, you are editing photos at times so that F.Lux cannot be used on the system. 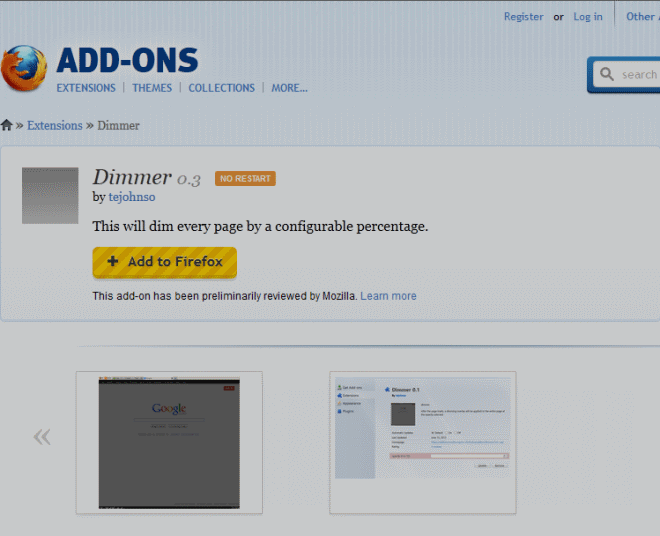 Dimmer is a free add-on for the Firefox web browser that dims all web pages that you visit automatically when it is running. Take a look at the following screenshot to see what it does. The extension applies a filter effect to all websites that you visit when it is enabled. It is applied after the website has fully loaded, which means that you may see the regular page for a while before the dimming effect is applied to it. You can modify the value of the effect in the preferences. It is set to 4 by default which you can set to a value between 0 and 9. A value of 0 turns the feature off for the time being, a value of 9 makes the page so dark that is is not readable anymore. I suggest you go down with the values first if you think that 4 is too dark as well. A value of 2 or 3 worked best for me during tests. There is no off switch that you can click on to quickly turn the dimming on or off. For that, you need to open the settings and either disable the add-on for the time being, or set its value to 0. A whitelist or blacklist would be handy to only apply the dimming on select web pages or at least exclude some from it. What if you are not using Firefox? Then you may be interested in the portable application Dim Screen which dims the whole display and thus all program windows displayed on it. Works really wonderfully but requires IMO a toolbar button. On/off as dim leverage is only accessible within the add-ons options. Looks like the developer is moving fast, so perhaps the add-on is bound to progress fast as well. This is absolutely a marvel for a dark environment (tunnel or night !). Unless people are still using CRT monitors and not flat panels there is no need for such an Add-on. If your flat panel’s brightness and contrast are raised up so high they glare, then you’ve set them too high in the first place. If you’ve set your LCD panel so high that the blacks practically glow like a black light display, you’ve set it too high. Most LED panels have a similar effect unless you have one of those newer ones where when they detect black images or black colour to render they simply turn off to increase the depth of the black colour. If you believe you turned your LCD/LED panel to the correct settings and you find it is too bright at night. STOP working in the dark. Turn on a lamp for Pete-sake’s. The light off a monitor was never meant to be the sole light source of a room. Some LCD monitors start to make noises when you lower the brightness. This add-on really helps on my laptop. I can’t turn the brightness down enough on my computer settings and there are no monitor settings.